I was not finding it easy to decide whether to proceed onward to Abha or not, as my previous experience of travelling from Ta'if to Al Baha had not exactly been something to cherish. In the end, my traveller's itch won over prudence. I left my hotel in Al Baha at about noon, after a leisurely breakfast at a nearby fast food joint and some surfing on the net. I was hoping that I would be able to cover the 350 km distance in about 5 hours, give or take. I allowed myself extra time for two reasons: a) it was hilly terrain, so I could not possibly drive at 100 + kmph and b) I (and my car) would need some rest periods to avoid the car from overheating and me from getting fatigued. As it turned out, the otherwise uneventful journey took over 7 1/2 hours. I reached Abha at about 7:45 p.m., making for an average speed of 45 kmph. There is one additional reason for such a long-drawn out drive: I stopped several times to take pictures of interesting things that I saw on the way. In fact, you could say that, for me, the journey was as important as the destination. Also, it would be correct to say that the journey was indeed a most interesting one: southern Saudi Arabia, and the Aseer region in particular, of which Abha is the HQ, is a green country with lots of plants, flowers, birds, etc. Also, there are many towns, most of them heavily populated, in line with the fertile nature of the countryside. 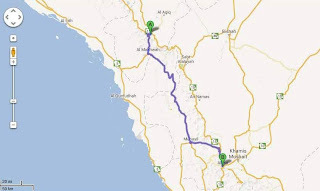 On my way to Abha, I crossed at least 4-5 big towns, each with malls, McDs-Pizza Huts-Herfy-Baskin Robbins- type of shops, large municipalities, water fountains, 5 + storey buildings, and so on. I would rate most of these towns 5-6 on a scale of 10, where 10 is a metropolis. More about the journey follows below. These garden-like areas allow tired traveller families to stop for R & R.
The first landmark was Biljurashi, which was 29-30 km ahead of Al Baha. Thereafter there were small villages and towns. The next big town was Bashaair, 98 km from my point of origin. Both Biljurashi and Bashaair were fairly big towns, with all the modern amenities I have already mentioned above. On the heels of the second town followed Bushiyaat, at 115 km. It wasn't as large as the previous two places, but by now I was looking for a place to have lunch. I also passed a fairly big town called Bani Amr', and then an opportunity presented to me at a place called Sabt Al Alaya, at 135 km. I reached this place at 3:00 p.m. It had thus taken me three hours to travel 135 km., an exact average of 45 kmph. This is where I lunched at a small restaurant - a half-chicken tandoori with rice and a soft drink. I saw many interesting murals on empty walls, as well as other forms of street furniture all along my way. At one place, I saw many canopies for travellers to rest under. At another place, I saw this wonderful symbol, under which I stopped to take a self-portrait. The view of the valley down below was lovely, with houses interspersed with greens, trees, and some farms. More towns came up as the journey continued, and I passed some small towns, and then came up to Namas (186 km). This is a big city (6/10), with a long axis almost 12-15 km in length. At Namas, I saw all the modern trappings of a city. There were car showrooms (Nissan, General Motors, Toyota) and fast food joints, large beauty parlours, expensive looking restaurants, multi-storeyed hotels, and so on. After Namas, one comes upon yet another big city (6/10 too), and this one is called Tanomah (218 km). Tanomah is a city that wants to be famous, as it has many decorative edifices along the roads, a huge municipality building, many banks (I counted 5 banks on the main road through which I was passing) and once again, all the things I saw at Namas. While reviewing a 2 night 3 day tourist trip to Abha, I came across the information that the trip also covered a lunch at Namas and a visit to an ancient village near Tanomah. I tried to look for this village (Al Alyn), but could neither find it not find out about it by asking some local Saudi citizens. Sometimes, it is a matter of not knowing the exact words to speak, and sometimes, the problem is the pronunciation of the words. Whatever it was, I was unable to succeed in discovering where it was. I have added some pictures of the things I saw on the way. Can you see the road in the distance? Here is a video of the flowing water of the traffic island depicted in the picture above. After Tanomah, I came across, one after the other, two smaller cities (5/10) with similar sounding names - Ballesmar and Billahmar. Thereafter, there was a place called Sabah, where there was a large park with a lot of families enjoying themselves. Interestingly, I also came upon a sign board pointing to a village called Mashooqua (!) (this word means a female beloved in Urdu language). The journey was drawing to a close. It was already past seven p.m. and Abha was still over 40 km away. I was getting tired and impatient to reach the destination. Some images were still possible using the ISO (high sensitivity) settings of my camera. I came upon a huge "gate" like structure when I was about 30 km away. This seemed like a gate into Abha. I took a few snaps of this awesome structure, and then I was under it and past it. and I refused it outright. They then took me to a bigger room on the first floor, but the room lacked access to internet (which was a highlight of this hotel, as it is of all, repeat, all, hotels of this area). Finally, I was shown a third room, which more or less met the criteria I had set for the room (A/C, hot and cold running water, clean toilet, TV with remote, and internet access). It had most of these, but this room had no table or chair and no almirah to hand my clothes. I was, however, too tired to reject the room. So I shifted in for the night, and paid up the cash (SR 200 per night). Read about Abha sight-seeing in my next post (s).